Resolve to save lives in January 2019 and celebrate your good health. 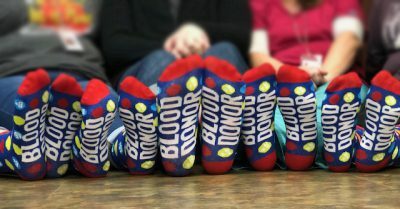 Give blood at one of our four donor centers or select mobile blood drives* between January 7 – 31, 2019, and you’ll receive this groovy pair of socks! You can make a real difference in the lives of others by giving blood this month, and then once each season. Let’s celebrate saving lives in January. To set your appointment to give during January 2019, click on the donor center closest to you below. The month of January is an appropriate time to observe this important national event. First, it is traditionally a month of significant need. Elective surgeries are often postponed during the busy holiday season and scheduled during the month of January. As a result, the need for blood donation increases in the first full winter month. In addition, it is a time for declaring resolutions for change in our lives. What better resolution than to donate blood every season – making a lifesaving difference for others? * Only mobile blood drives featuring the blood-type socks on their promotional posters will receive socks (high schools, college, and universities).